I have around 800 miles on these tires. The rears are in perfect shape but the two front tires are wearing fast and on the outside edges faster than the inside edges. Is this a tie rod adjustment problem? Yup, tie rod adjustment, too much or too little toe in. Need a warmer day to putz with it. If one side is wearing more incorrect camber. If you had feathering then toe in. Also looks like you may be over inflated. It wouldn't hurt to adjust toe in as well as camber. You will need to copy and past the URL below as the hyperlink didn't copy correctly. They look like the tires on my T as far as tread loss down the center of the tire goes. I think that's pretty much how those "T-Driver" tires wear. They would have to run seriously under-inflated for the edges of that tread pattern to have contact with pavement. 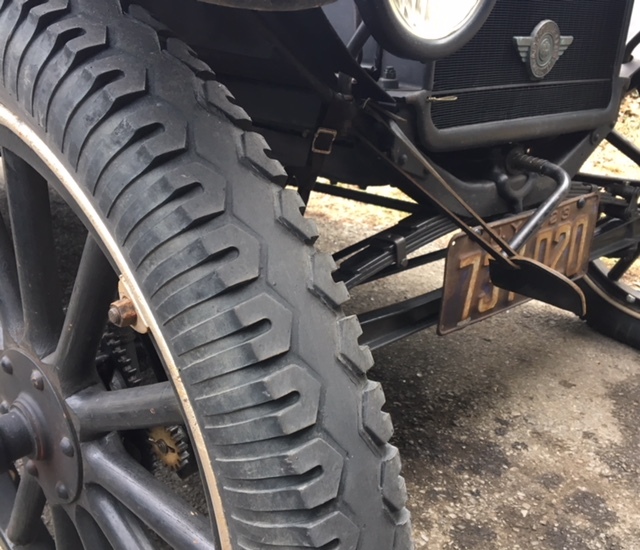 Too much toe-in (tires too close together in the front) as indicated by the feathered edge on the inside of the center tread. Yes that is changed by tie rod adjustment. Excessive Toe out = the same wear pattern but on the inside edge of the Tyre. Set your toe in to 1/8 - 1/4�. Yes, I was driving under-inflated for awhile after my air compressor broke. Finally got it fixed and got them back up to 55-60 lbs. The wear though was much more on the fronts than the rears and the treads on the outer edges of the fronts are really close to smooth at this point. Was hard to see before I cleaned off the dirt which is why it got left unchecked.